Comments: Offering is for $250 buyer�s credit. 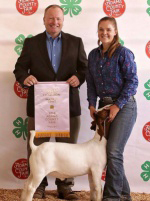 Richardson Show Goats have produced county fair champions throughout Colorado and Wyoming as well as the Reserve Champion Market Goat at Wyoming State Fair in 2016. Genetics for this year�s wether crop are a Money Bags Son 1203 who is double bred 191 and Bean 6503. Comments: Offering is for $200 buyer�s credit. Located in the middle of the map of who�s who in Colorado�s club lamb industry, Hickey Livestock has generated lambs and goats that have been competitive from the county to the national level. You may use the buyer�s credit on any purchase at the farm or online of $500 or more. Check out their website at www.hickeylivestock.com. Comments: Offering is for $100 buyer�s credit. SS Livestock introduced genetics from Tom Slack into their Dorset flock three years ago and have improved their quality by leaps and bounds. Recently they had the Champion Any Other Meat Breed Ram, Ewe and Flock at the 2019 National Western Stock Show. While, a wether from SS Livestock placed 4th in the 2019 NWSS Junior Market Lamb Show heavy weight Dorset class.